Courtesy The World View facility, and the county-approved lease for that site, has been the subject of legal battles. Pima County's deal with space balloon company World View Enterprises is on better legal footing after the Arizona Court of Appeals ruled in favor of a county's lease agreement, overturning the lower court's February ruling. The Phoenix-based Goldwater Institute, a Libertarian think tank, sued the county in April, saying the deal with World View didn't follow the competitive bidding process required when leasing property. 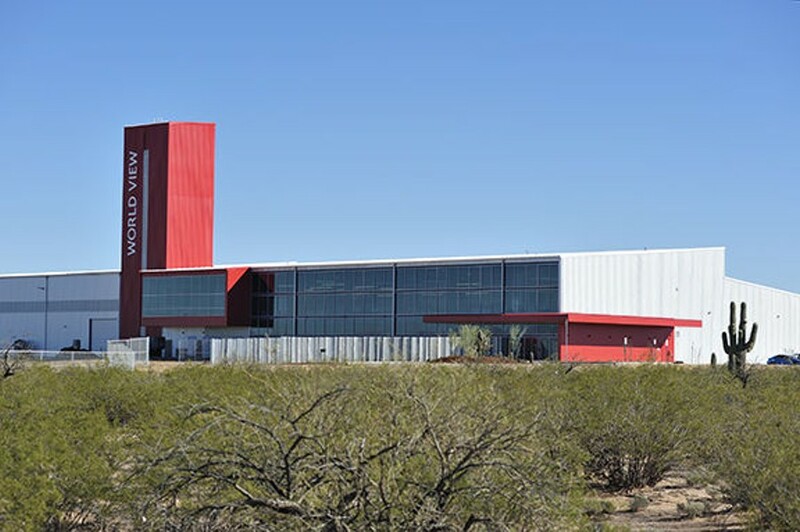 Pima County officials signed a 20-year lease with World View in April 2016, which included the county promising a $15 million investment on a launch pad and 135,000 square-foot facility on county-owned land. World View would repay the county over the life of the lease. The company would pursue "space tourism" and also launch "stratollites," or high-altitude balloons that double as satellites for a cheaper price. They also agreed to bring with them a number of well-paying jobs. The court's unanimous ruling cited a statute that says the county doesn't have to follow a competitive bidding process when lease agreements relate to economic development purposes. County Administrator Chuck Huckleberry said such lease agreements are what companies look for when relocating or expanding. He said the county will use the same statute when making deals with other major employers, such as Vector Space. "Goldwater has been counterproductive to economic expansion," he said. "A lot of companies interested in economic expansion were questioning relocating to Arizona." The Goldwater Institute Senior Attorney Jim Manley argues competitive bidding is necessary to "guard against favoritism, fraud, and public waste." He said the organization plans to appeal the decision to the Arizona Supreme Court. When the county first approved the agreement with World View, four of the five supervisors voted for the project, with Supervisor Ally Miller as the outlier. Supervisor Sharon Bronson said they're pleased with the appellate court decision, although she's aware an appeal is likely. "It was a strongly worded decision that allows us to play to our regional, economic strengths," she said. "It will help us grow jobs and thanks to our business partners who supported us in this effort."